The real value of managed services is in an integrated blend of managed and professional services. 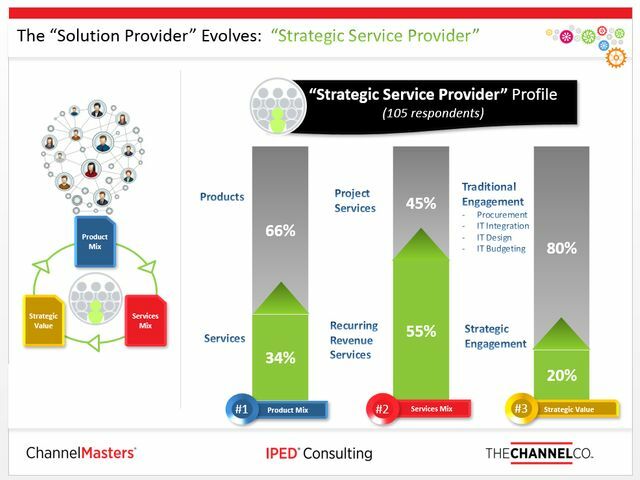 The truly mature managed services customer views their service provider as a strategic partner and trusts them to develop and deliver solutions to their businesses complex challenges. What does this integrated service model look like? It moves beyond mere device management into end-to-end service delivery, reaching out and touching many parts of a customer’s business. It integrates security services across several key areas, including user authentication, application management, data protection, gateway services, and device management. This is part of a broader service offering that includes an advisory role, with better monitoring and reporting, tailored to the customer’s particular business goals. The endgame for this integrated service offering is a single view of information security and risk that delivers information and decision support for the customer. The partnership delivers actionable information on network and application performance, user experience monitoring, security, and social networking statistics. It is complemented by an advisory channel, providing meetings and hotlines for the customer to get help with key business decisions, based on a complex dataset. A truly integrated managed services offering adds greater flexibility, and increases a company’s visibility across its entire IT infrastructure. However, this level of service requires closer engagement with the customer and a departure from the arm’s length, fire-and-forget approach of more rudimentary managed services contracts. The customer must be prepared to engage at this level, and the service provider must bring in service delivery managers and account managers that understand the customer’s business. Companies that make this leap can move beyond mere cost reduction by reducing complexity and increasing visibility. As the customer integrates more services with their trusted provider, their risk profile reduces, because they are enabling the service provider to connect multiple services and provide visibility across all of them. Done well, this frees up resources that would normally be devoted purely to operations, enabling them instead to focus on strategies that can help to transform the business. In many cases, this has an immediate, tangible effect on the IT department. In the old, first-generation managed services model, a service provider might inform a customer of 50 new vulnerabilities across various manufacturers’ products. That kind of information is often not useful to the client. What the customer needs is an understanding of which vulnerabilities affect their key business processes, and an easily-digestible impact analysis that enables them to quickly analyse the risk, and make a decision on how and when to fix them. Instead of fighting operational fires around application performance, user experience and security, CIOs can concentrate on the issues that make IT a strategic partner in the business, including revenue generation and process transformation. Rather than simply fighting to keep the engines running, they can explore opportunities such as cloud computing and employee mobility. By working with a trusted partner, IT departments can begin transitioning their internal business clients to new computing models with a robust operational platform. This continuous, integrated service model further empowers companies to push into new areas. Global expansion can be challenging for companies managing their own infrastructure, for example. Trusted managed service providers can help by offering an end-to-end approach when looking after new offices in emerging markets. Many managed services operations may be little more than discrete outsourcing operations, but the process can be so much more. Are you ready to realise the benefits?